"The return of the spectacular spinning songbook" is a live album recorded in May at two shows in Los Angeles. Unlike most albums, the setlist wasn't planned in advance - in fact the setlist was only chosen during the show. Elvis and his band play a few songs before picking an audience member out to come on stage and spin a large wheel which is marked up with dozens of song titles. The song title at the top when the wheel stops spinning is the one that gets played next - with the audience member getting to sit on stage as the song is played. This takes audience participation to new levels, and is a great idea. Elvis Costello has done this before - hence the "return of" in the title - he used the idea 25 years ago (so its long overdue for a return). The Return Of The Spectacular Spinning Songbook is a 3-disc (CD, DVD, 10" vinyl EP) live box set, recorded over a 2-night stand at The Wiltern in Los Angeles on May 11 and 12, 2011. Limited to 1500 copies worldwide, each set is individually numbered with a special commemoration card autographed by Elvis Costello. 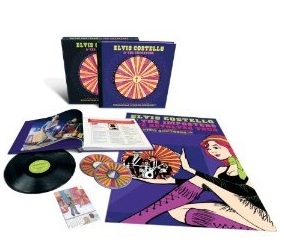 This super deluxe package includes a 40-page hardcover book packed with candid photos, a tour diary of Costello's musings from each tour stop, a 20" x 30" concert tour poster and a limited edition postcard. As box sets go, this is a fantastic package, although I'd question the inclusion of vinyl in an age when many people no longer have a record player to play it on. The CD was recorded from both nights performances at the Wiltern. The DVD is from Costello's show on May 12, 2011, and includes a special guest appearance by the Bangles, plus bonus footage including behind-the-scenes moments captured with the Imposters as well as extra performances not included in the main set of the show. The 10-inch vinyl record features four songs only available in this set. 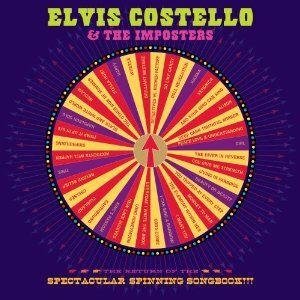 My first reaction when I picked up the album was one of surprise and a little disappointment - no "Olivers army" on the track listing, so my favourite Elvis Costello track isnt included. After listening to the album though, any initial disappointment was quickly dispelled - with such a long career, Elvis Costello has so many great songs that he can afford to skip one hit and still put together a fantastic show and album. There isnt a single weak song here which is impressive, and this is a fantastic live album. For "Tear off your own head (it's a doll revolution)" Susannah Hoffs of The Bangles is credited as appearing, but when you listen to the CD or watch the DVD it's actually the three members of The Bangles who appear. The Bangles did a cover of the song the year after it was released, so were an obvious choice to guest star. It was slightly surprising to see that rather than just running off stage after doing their song with Elvis Costello, they actually stayed and danced during the next song - a cover of the Rolling Stones hit "Out of time", but it was nice to see (they also come back on stage for the final song as well). The CD is excellent quality and is a very enjoyable listen, but it skips the audience interaction parts - probably because it doesnt work as well without the video, and partly to fit in more songs I suspect. Either way its a great CD that you can listen to again and again. For me though, the DVD is the better of the two - seeing the songs being chosen and the audience involvement makes it stand out from other live albums for me.